Surprised By a New PSC Bumper September 2012. My beautiful wife purchased this bumper for my birthday. She prefers to surprise me so I know it was difficult for her to ask me what I wanted. Even though it wasn’t a surprise, I absolutely love it. Poison Spyder Customs makes awesome stuff and the Brawler Lite Front Bumper is no exception. The stubby style bumper covers enough of the grill to protect the engine bay and other essentials from an impact off road. It leaves the front wheel completely exposed, allowing for additional flex and approach angle. The front hoop gives it an aggressive look and protects the grill, radiator and winch from branches and other off-road elements. 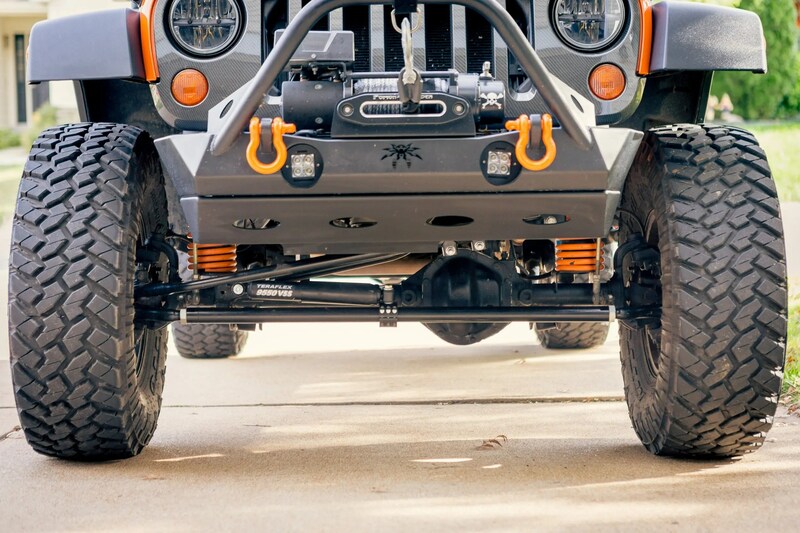 The bumper’s shackle tabs are stout, designed with clearance in mind and provide a solid recovery point. Due to their girth the shackles don’t rattle and isolators aren’t necessary, which makes me happy because isolators are an eyesore. There are also provisions for fog lights. Originally, I used my factory fog lights which fit perfectly. When I upgraded to Rigid Industries LED fog lamps I used an adaptor to make the square lights fit a round hole. The Poison Sypder Brawler Lite Front Skid compliments this bumper well and protects my Rubicon’s electronic sway bar disconnect. Poison Spyder recommended ordering the bumper raw and having it powder coated or painted locally. Shipping can be a little rough on parts, even powder coat. Mark, the owner of Springfield Powder Coating, did a great job on my bumper. We matched the factory Rubicon rock rails, the black powder has a slight texture and turned out really well. Removing the stock bumper was the hardest part of the install. Overall, I’m very satisfied with my birthday present and my Jeep build is coming along. Stay tuned, there is more to come. This bumper is (mostly) awesome. It has taken a hit or two off-road when my approach angle wasn’t as great as I expected. The Brawler Lite secures my Warn winch extremely well and provides excellent recovery points, which have come in handy on multiple occasions. My only gripe is the fog light buckets, they are welded in place slightly crooked. With the round factory fog lights installed, this wasn’t noticeable. But, with Rigid Industries Dually LED’s with Rigid’s factory mount adaptor, this slight offset is very apparent (as shown below). This grates against my type-A personality. Several people have pointed it out, which only adds salt to the wound. The buckets are affixed in a manner that would be very difficult to cut out and re-weld. Not to mention, this is an expensive bumper, I shouldn’t have to do this. I’ve seen many other PSC Brawler Lite bumpers that don’t have this issue. I guess it’s just indicative of their quality control. I sent a message on Facebook asking if there is anything that can be done, to which I got no reply. So, I guess that is an answer of sorts. If you get a bumper with level foglight mounts, it is awesome. But, with such an oversight on build quality, I have a hard time recommending it to other Jeepers.